Eagle-eyed readers might well recognize the TEDDD Conference. But this page has TWO “easter eggs” and now this page is out there, fully worked up and ready for you viewing pleasure, I can reveal the second one. Bobby and Tessa’s boss is called Grouprock. 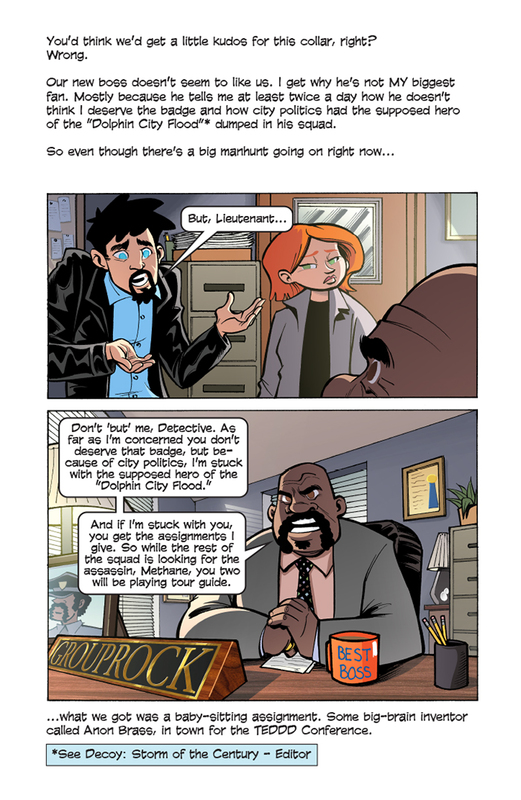 Some of you (even some of the people here in Decoy Tower, where we lovingly craft this webcomic for you) might think it’s a nod to Stephen King. It is not. Grouprock is based on m’colleague Court. And the character looks EXACTLY like Court.